TSF 2018 Cincinnati DPOY: Ivan Pace Jr.
PARK HILLS, KY – What started slow got out of hand quickly. Covington Catholic defeated Dixie Heights last night thanks to a 40-point second quarter. 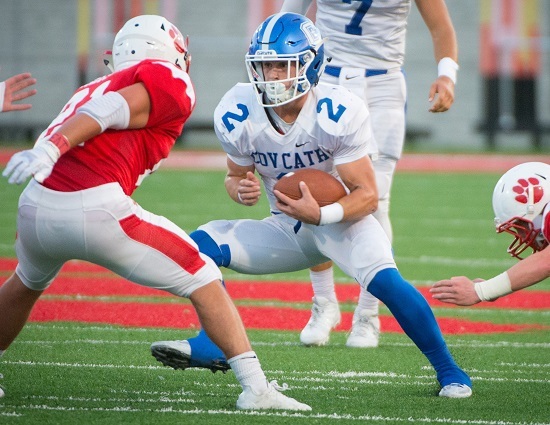 With CovCath ranked #1 in Kentucky and coming off a statement win last week against Highlands, many were curious to see how they would handle the drop-off in competition. The game started off slow, as neither team scored until CovCath did halfway through the first quarter on a 14-yard Luke Summe touchdown run. Once the first quarter ended though, CovCath caught fire. CovCath scored four seconds into the second quarter on a McGinness four-yard touchdown run, but failed to convert on the two-point try. Then, four minutes later, Michael Mayer reeled in an 89-yard touchdown pass from Caleb Jacob to make it 19-0. CovCath once again failed to convert a two-point try. Jacob followed with another touchdown pass, this one of 16-yards to Jack Coldiron. McGinness then had three straight rushing touchdowns of eight, five, and 24 yards respectively to give CovCath a 47-0 lead going into halftime. The only other score for CovCath was a 27-yard field goal from Trey Gronotte towards the end of the third quarter. Dixie was held scoreless in the first three quarters of play. Their lone points came from a Jeremy Adams 22-yard touchdown pass to Channing Williams, and a successful two-point conversion that followed. Williams led all skill players in total yardage for Dixie with 121 receiving yards on seven receptions to pair with his TD grab. For CovCath, McGinness had 119 rushing yards on just nine carries for four touchdowns, while Jacob threw for 166 yards and two touchdowns on 6-9 passing. The impressive performance for CovCath wasn’t just on offense, as the defense finished with nine tackles-for-loss, one fumble recovery and two interceptions. CovCath is looking to go undefeated for the second straight year, and hopes to win-out in the playoffs as well to repeat as Class 5A State Champions. UP NEXT: Dixie Heights visits Ryle (2-6, 1-0); Covington Catholic hosts Campbell County (6-3, 1-1).